*Please note that many PWM fans have a minimum speed higher than 300rpm and as the function of “no stop” mode is to not let fans go below 300rpm, it is only useful for fans which are generally able to go below this speed. For example, a fan with 500rpm minimum speed will act the same with “no stop” mode on and off. What pin configuration does the NA-FC1 use? How many fans can be connected to the NA-FC1 controller? Can the NA-FC1 be used with 5V fans? 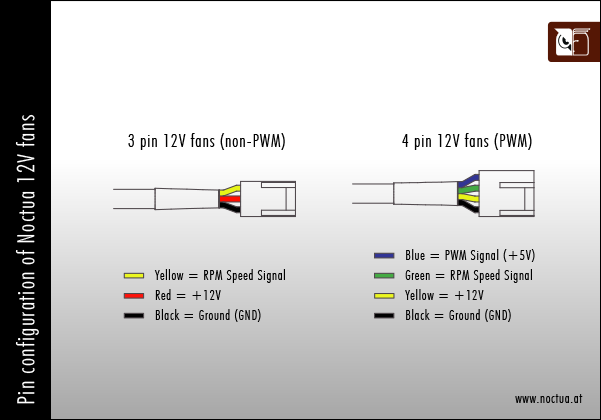 The maximum number of fans that can be connected to the NA-FC1 is limited by the total combined power draw of all fans, which must not exceed 3A for 5V and 12V fans. Please also keep in mind that there may be lower limits imposed by the power source (e.g. 1A max. for most motherboard fan headers, max. 0.5A max. for USB 2 ports, etc.). However, as the NA-FC1 only passes through the power and regulates fan speed via PWM rather than voltage control, these limits are not related to the NA-FC1 as such. Yes, the NA-FC1 can be used with 5V and 12V fans.